SCOTTSDALE — For years, I’ve enjoyed going to Spring Training in Scottsdale to watch the San Francisco Giants and their rivals. The Cactus League is home to some of my other favorite baseball teams, including the A’s, Cubs and (yes) the Dodgers. The games are played in intimate ballpark settings, often allowing you to visit with the players and the coaches, and easily get autographs for your children (or yourself). And the weather is almost always pleasant. Fans are much closer to the action than the regular big-league ballparks, allowing you to hear the crack of a bat, or the coaches and players conferring, as if you were almost on the field. Scottsdale Stadium seats 12,000 people, compared with 42,000 in AT&T Park. Spring training draws some of the most passionate (and imaginative) fans. The Giants-Dodgers rivalry is just as fierce in Spring Training. 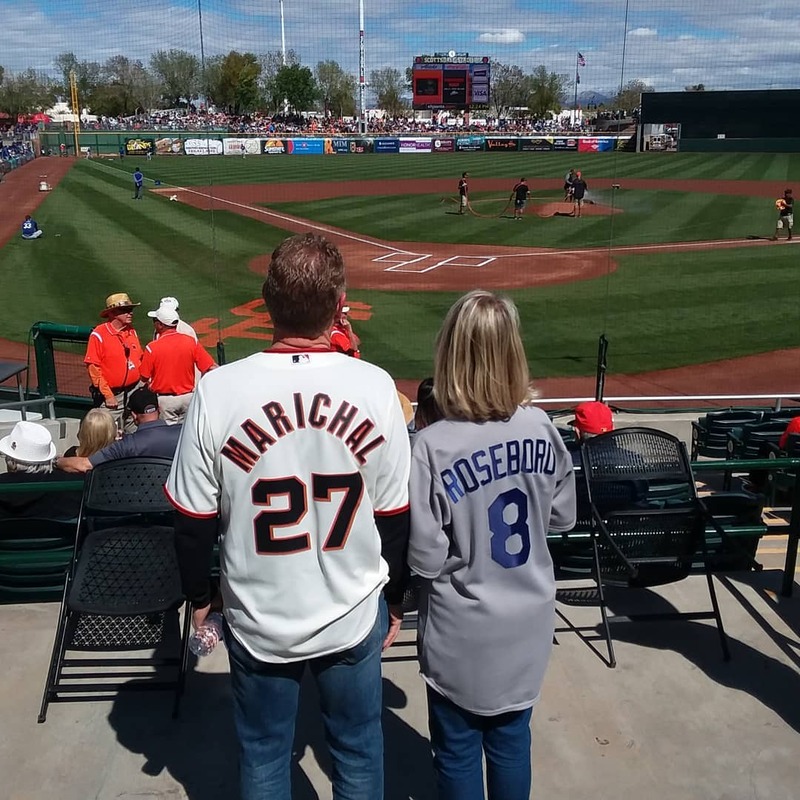 This weekend I met a couple with long memories of that rivalry, going back to the ’60s: He was wearing a jersey for Juan Marichal, the famous Giants pitcher. She was wearing a jersey for Johnny Roseboro, the famous Dodger catcher (see photo). But the ending had a happier ending, as the couple reminded me. Both men put the incident behind them, and the two became friends. When Roseboro died in 2002, Marichal was an honorary pallbearer and a speaker at the funeral, as ESPN reported. Not only the fans but the ballpark’s workers love the scene at Spring Training. Working there is a dream for many retirees. Many are volunteers who love the game. This weekend I got to know Robin, who was an usher in our section behind home plate. Robin is retired, splitting his time between Portland and Phoenix. He has a Ph.D. from UC Berkeley in electrical engineering, and worked at Apple for decades, then Intel at its facility near Portland. And he loves baseball. Over the years, I also have gotten to know Derrick, a legendary lemonade salesman at the ballpark. My son and I first met Derrick when we came to Spring Training in 2009. Derrick has a catchy and memorable sales pitch: “Lemonade, lemonade, like Grandma made. I KNOW you want it,” he shouts. Derrick has been at Spring Training for over 30 years. A vendor can sell as much as 150 cups of lemonade per event, but Derrick can sell twice as much.